Now that we’re down to the Final Four, let’s take a deep dive into each of the four remaining teams. Today: South Carolina. East Region Champions. Despite entering Selection Sunday having lost six of its previous 10 games, South Carolina was given a surprisingly-high seed (#7) in a surprisingly-favorable location: Greenville, South Carolina. The Gamecocks took full advantage, crushing #10 seed Marquette before pulling off one of the biggest upsets of the NCAA Tournament against #2 Duke, scoring 65 points in the second half en route to an 88-81 runaway victory against the National Championship favorite. In its first Sweet Sixteen since appearance since 1973, South Carolina then held #3 Baylor to a season-low 0.76 points per possession; two days later, the Gamecocks put the finishing touches on their Cinderella run by upending SEC rival #4 Florida, limiting the Gators to 0-of-14 three-pointers in the second half on their way to a seven-point triumph. Frank Martin. In just five short years, Martin — a former nightclub bouncer and perhaps the scariest man in college basketball — has lifted a program from the depths of irrelevance to its first Final Four in school history. 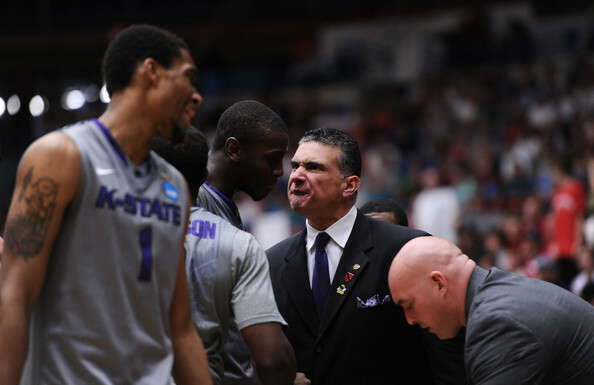 And he’s done it with the same hard-nosed, defensive-minded coaching style that made him successful in his first Division I coaching stint at Kansas State (2007-12). The former Bob Huggins assistant has clear stylistic similarities to his mentor, employing an aggressive, relentless brand of basketball intent on wearing down opponents mentally and physically. In eight of his 10 years as a college head coach, Martin’s teams have ranked among the top 40 nationally in adjusted defensive efficiency. The Miami native spent 15 years coaching high school basketball in his hometown before joining Northeastern as an assistant in 2000, so his decision to take the South Carolina job in 2012 — a program with only three Sweet Sixteen appearances in its long history — was not overly surprising. Martin knows how to be patient. After missing the NCAA Tournament in his first four seasons, that patience is finally paying off. For South Carolina, success starts on the defensive end. The Gamecocks rank second nationally in adjusted defensive efficiency, fourth in defensive turnover rate, 12th in effective field goal percentage defense, and perhaps second to only West Virginia — Huggins’ group — in sheer physicality. Led by a pair of elite defenders in 6’5” Sindarius Thornwell and 6’6” PJ Dozier, South Carolina presses and traps all over the court, making it difficult for opposing ball-handlers to cross the timeline, much less comfortably run offensive sets. In the half-court, the Gamecocks aggressively extend on shooters, preferring to commit fouls over allowing open shots from the perimeter. Their length and knack for swarming to the ball (often employing a half-court trap) makes clean interior looks nearly as difficult, especially with 6’9” Chris Silva — a good per minute shot-blocker — manning the paint. They simply deny everything. Offensively, aggression remains the name of the game: South Carolina scores a whopping 23 percent of its points from the free throw line and another 50 percent from inside the arc, attack the basket at will, often off of turnovers. Having big, physical guard/forwards like Thornwell and Dozier helps. Limiting three-pointers. South Carolina does an exceptional job of taking away perimeter jumpers, allowing opponents to score just 25.6 percent of their points from behind the arc. The Gamecock guards relentlessly press up on shooters, sometimes resulting in fouls, but often resulting in forced jumpers or haphazard drives late in the shot clock. Really, the same reason opponents have such a difficult time shooting three-pointers is the same reason South Carolina forces turnovers at a higher rate than all but three other teams in the country: opposing guards simply can’t breathe once they cross half-court. Attacking the basket. Thornwell is in a class of his own when it comes to attacking the rim. The senior ranks 13th nationally in fouls drawn per 40 minutes, a testament to his bullish aggressiveness in the lane and willingness to push the ball as far and as fast as back-peddling defenders will allow. When South Carolina forces turnovers (which is often) he and his teammates waste no time getting downcourt—the Gamecocks average just 16.6 seconds per offensive possession. They also pound the offensive glass, cleaning up misses at the third-highest rate among SEC teams. 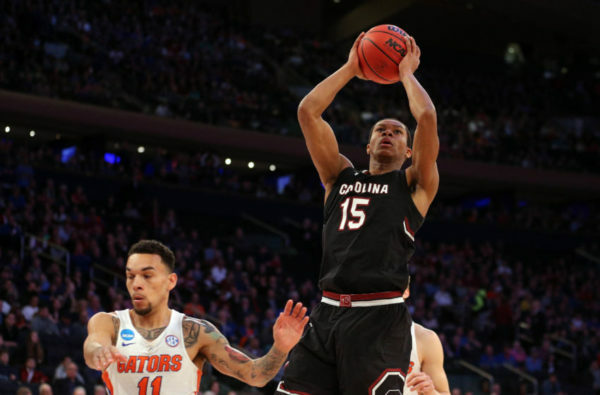 Between free throws, offensive rebounds, and plain strong drives to the hoop, South Carolina is able to sustain itself offensively despite its poor shooting numbers. Endurance. According to this account, South Carolina full-court presses during the majority of practices and often plays five-on-seven (advantage to the offense) in order to whip its dogged defense into shape. That grueling work ethic clearly pays off on game day. The Gamecocks are +54 in the second half during the NCAA Tournament, wearing down opposing offenses to such a degree that their offense — which, again, thrives on attacking the rim — can flourish. South Carolina’s second-half blitzes against Duke, Marquette, and Florida are shining examples. Conditioning, both mental and physical, seems to matter. Shooting. At 47.4 percent eFG, South Carolina ranks 299th nationally in effective field goal percentage. That’s not good. Outside of Thornwell (39.4% 3FG), there really aren’t any serious outside shooting threats on the roster. Guard Duane Notice (10.2 PPG) is capable of getting hot, but he’s also very streaky. Dozier (13.8 PPG) takes a lot of shots, but he’s usually not all that efficient. If Thornwell is off and Silva isn’t going to work inside, the Gamecocks can become very stagnant very fast. Foul trouble. That aggressive defense has one glaring downside: free throws and foul trouble. Not only do South Carolina’s opponents score almost 27 percent of their points from the charity stripe, but several crucial Gamecock players — most notably Silva —are often forced to take a seat early. The 6’9” forward has fouled out 10 times this season, seven of which South Carolina lost. Dozier, another superb defender, also runs into similar trouble from time to time. Against talented offenses like Gonzaga, North Carolina and Oregon, free points and foul trouble could become an issue. One-dimensionality. 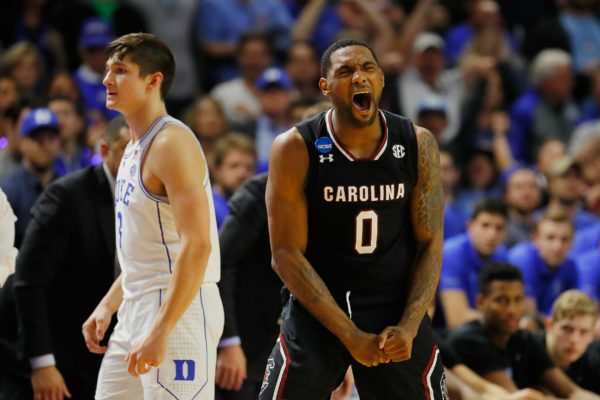 It may be oversimplifying things to say that South Carolina’s success boils down merely to defense and Sindarius Thornwell, but it’s not that far from the truth. Fact is, the Gamecocks must continue dominating on defense, and the senior sensation must continue to playing at a high-level offensively in order for Martin’s team to have a chance in Phoenix. If one of those two elements slips — say, the defense sputters like it did against Arkansas in Feburary, or Thornwell struggles like he did against Alabama in the SEC Tournament — it’s hard to envision South Carolina recovering. Sindarius Thornwell (21.6 PPG, 7.2 RPG, 2.2 SPG). Before Duke’s Round of 32 loss to South Carolina, Mike Krzyzewski called Thornwell “the best, unheralded, great player in the United States.” And even that might be an understatement. The 6’5” in-state product is averaging nearly 26 points per game during NCAA Tournament play, showcasing his relentless aggression (he’s already attempted 39 free throws), shooting ability (42% 3FG over four games), and superb defensive skills. He’s also an outstanding offensive rebounder, once ripping down 10 offensive boards en route to a ridiculous 44-point, 21-rebound stat line against Alabama on February 7. Among players who have attempted 250+ free throws this season, only a handful of players boast a higher free throw percentage than the senior (83% FT). Thornwell also led the SEC in steal percentage during the regular season. There’s a reason he was the coaches’ choice for Conference Player of the Year (not to mention 7th in KenPom National Player of the Year rankings)—Thornwell is great. PJ Dozier (13.8 PPG, 4.7 RPG). For better or worse, the talented sophomore takes a staggering 31 percent of his team’s shots while on the floor, which is roughly 70 percent of the time. That shot rate is higher than Thornwell’s (28.7%). When he shoots 50 percent or better from the field, South Carolina is 11-0; when he shoots under 40 percent, Martin’s team is 10-6. That seem like “picking and choosing” statistics, but it’s hard to deny that the Gamecocks’ offense is markedly better when Dozier is efficient. Silva, and bench production from players like forward Maik Kotsar (12 points vs. Florida), will also be key. When are we going to learn? South Carolina has entered each of its last three games as the underdog, yet won each contest by an average 11.3 points. It hadn’t scored over 1.1 points per possession since February 15 prior to Selection Sunday; in the four games since, Martin’s group has surpassed that mark three times. Tough, confident, and afraid of nobody, the Gamecocks now face their most difficult opponent yet: a Gonzaga team that boasts the nation’s most efficient defense with nearly an offense to match. Still, count South Carolina out at your own risk. 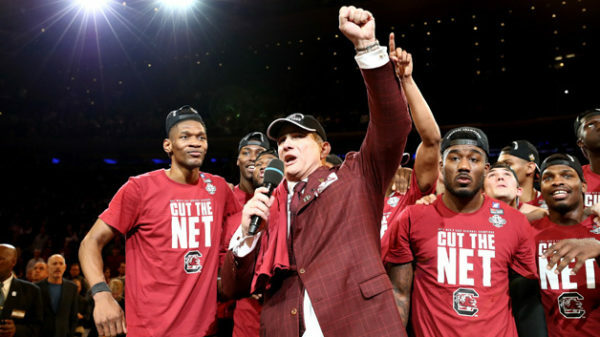 Freeze Frame: Just How Good Is South Carolina? South Carolina strung together 15 straight wins to begin the 2015-16 campaign, so forgive us all if we are still a bit skeptical over the Gamecocks’ latest hot start. Last November’s highlights included iffy neutral site wins over Hofstra and Tulsa, leaving some question about just how good Frank Martin’s team really was (it turns out that question was valid). This season, however, the Gamecocks enter December leaving little doubt as to their legitimacy after a pair of impressive KenPom top 25 (Michigan and Syracuse) victories already on their resume. Frank Martin’s Gamecocks are defensive stalwarts. The hallmark of Martin’s tenure in Columbia has always been his defense. The Gamecocks have boasted the 36th and 21st best defenses, respectively, over the last two seasons, but early indicators suggest that this may be his best defensive team yet. South Carolina held Michigan and Syracuse to just 19.2 percent and 31.8 percent shooting, respectively, from the field. In this edition of Freeze Frame, we will analyze the Gamecocks’ defense to assess the ultimate ceiling for South Carolina this season. With Halloween still fresh on our minds, there is nothing scarier than the bottom tier of the SEC. There are tigers, tigers, even more tigers, and there is nothing more frightening than a grumpy Frank Martin or a Johnny Jones-led offense without the services of Ben Simmons. If none of that sends chills up your spine, just think about Missouri basketball. If you were lucky enough to get through Halloween night with some leftover candy, the days that follow usually involve filtering through your stash to devour the best of the rest. Sometimes you are lucky enough to find a full size candy bar or those Halloween Kit-Kats (which are the best, by the way) hiding near the bottom. But more often than not, you end up with a skeleton pencil or those disgusting brown globs of goo wrapped in black and orange wrappers. This post is less of the delicious Kit-Kats that disappeared within seconds of returning back home, and more of the box of raisins that sat in the old lady down the street’s pantry for a decade. Let’s unveil our series of team previews beginning with the bottom tier of the SEC (#14-#10). Team Analysis: Wes Clark was dismissed; Namon Wright, Tramaine Isabell and Jakeenan Gant transferred; and Ryan Rosburg graduated, pretty much leaving the cupboard bare for Kim Anderson’s third year. Missouri’s defense was bad and its offense was even worse. There is nothing to suggest that this year will be any better in Columbia. 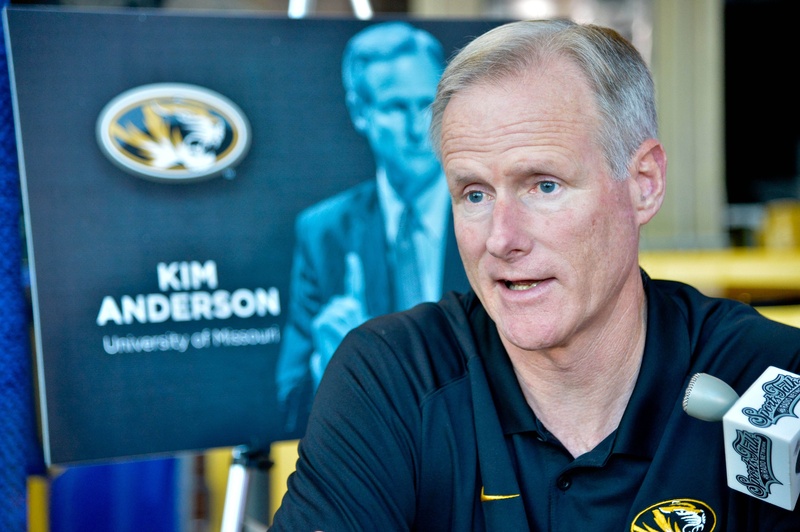 Burning Question: Can Missouri protect its home floor in non-conference games? Last season, the Tigers won seven of their eight non-conference games at Mizzou Arena (losing only to NC State). The home slate wasn’t exactly a murderer’s row of college basketball powerhouses (with Wofford, Maryland-Eastern Shore, Arkansas State, Northern Illinois, Nebraska-Omaha, Arkansas-Pine Bluff, and Savannah State making the trip), but neither is the 2016-17 schedule. Missouri welcomes Alabama A&M, Northwestern State, North Carolina Central, Western Kentucky, Miami (OH), Arizona (well, they can’t all be cupcakes), Eastern Illinois, and Lipscomb to Columbia, meaning that if Anderson’s squad has any hopes of getting to double-figure wins this season it has to enter January without any embarrassing losses. Something about this team suggests that won’t happen.